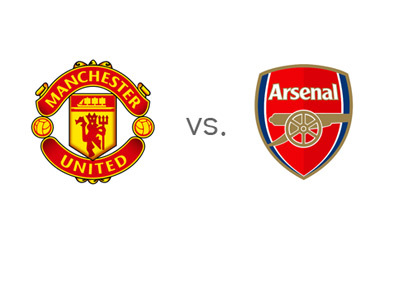 Manchester United are hosts to Arsenal in the eleventh round of the English Premier League on Sunday, November 10th, 2013 at Old Trafford. The kick-off is at 4:10pm. This is one of the most anticipated matches in Europe this weekend. Last year's champions, Manchester United, are gaining momentum after a slow start to the season. Arsenal are first in the EPL at the moment, five points clear from second place Chelsea and are pleasantly surprising with stellar performances domestically and in Europe. Manchester United most recently drew vs. Real Sociedad 0-0 in the UEFA Champions League. Prior to the match in San Sebastian, they eliminated Norwich City out of the Capital One Cup with a 4-0 victory and then they beat Fulham 1-3 away in the league. Arsenal are coming off a stunning 0-1 away victory vs. last year's UCL finalists Borussia Dortmund. Just days before, Arsenal beat 3rd place Liverpool 2-0 at home in the league. Both Arsenal and Manchester United are in the spotlight right now and this encounter promises to be a treat. Manchester United are the favourites to win, but not by much. A 100 € bet on the hosts could return 130 € in profit, while the same bet on Arsenal could return 210 € in profit. Robin van Persie, who has netted six goals domestically this season, is the favourite to score at 13/10, followed by Javier Hernandez, Olivier Giroud and Wayne Rooney who are valued at 2/1 each. The most likely score, according to the odds, is a 1-1 draw offered at 6/1. Can Arsenal continue their magic run towards the title, or will Wayne Rooney & Co. have something to say about it on Sunday?